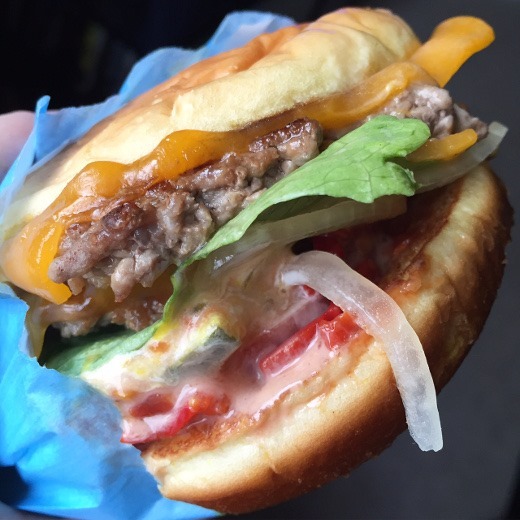 It’s been a few weeks since my last “What I’ve Been Nomming…” posts, so I have plenty to share today! Breadstick Pizza – Always a fave. Breaks away into breadsticks, perfect for dipping into marinara or pizza sauce. 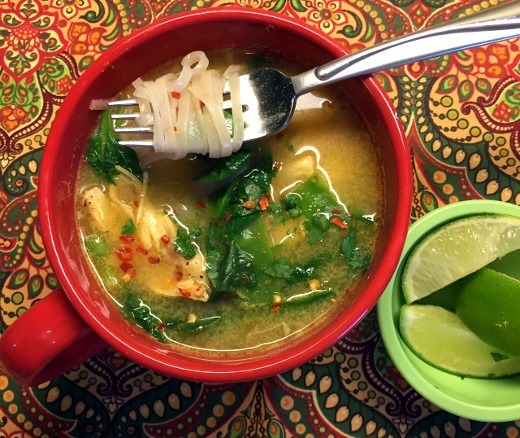 Coconut-Curry Chicken Soup – That broth is magical. 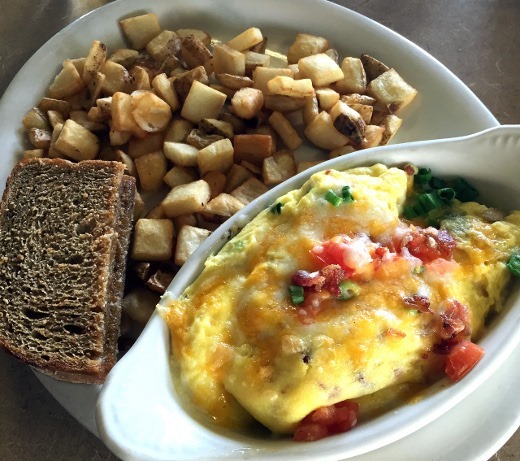 Eye Opener Scramble at Café Marie – the portion was small for the price! 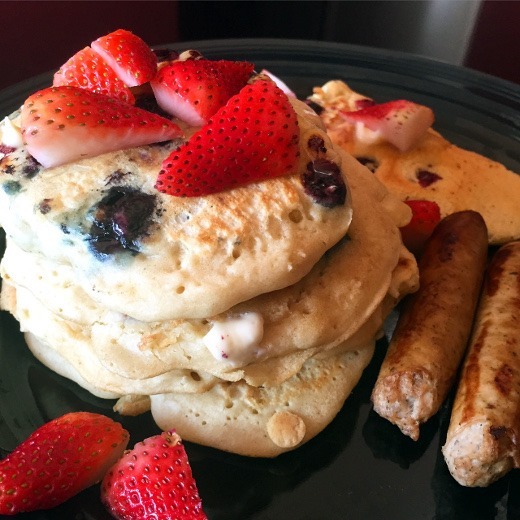 I whipped up a batch of blueberry pancakes thanks to a pregnancy craving last weekend and they were amaze! We had some pancake mix leftover from a few months ago after huz had his wisdom teeth pulled and then craved pancakes. Apparently we are both pancake-cravers! I wonder if baby nom nom will love pancakes too? We’ve been trying out a few different meal ingredient delivery services, and a week or two ago we had a shipment of three meals for two from Blue Apron. 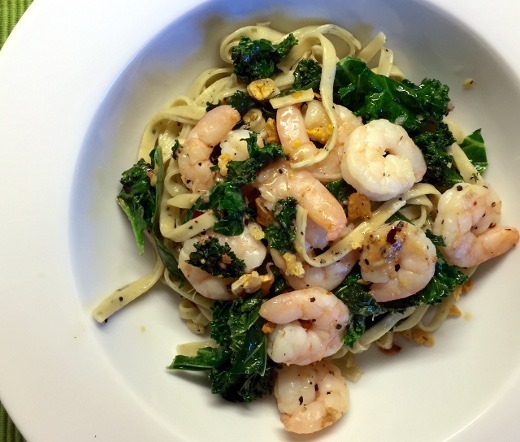 Lemon & Black Pepper Shrimp – this was a hit; the addition of fresh pasta was a good one, and I enjoyed the nutritional boost added by including kale. Fava leaves were an interesting addition. 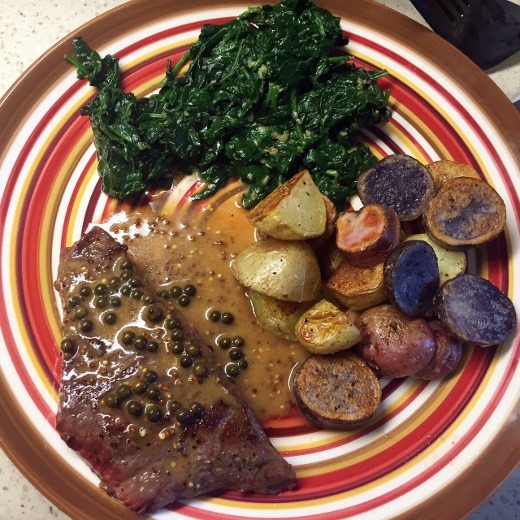 Pan-Seared Steaks with Green Peppercorn Sauce & Roasted Fingerling Potatoes – This one was a miss for us. We learned that we are NOT fans of green peppercorns (or else ours were rancid!) The flank steak was thick and hard to cook to our desired degree of doneness on the stovetop (being pregnant I have to eat mine pretty well-done these days to be safe). I actually forgot to take a picture of my favorite of the three Blue Apron Meals – the Spiced Turkey Meatball Pitas. I loved the Moroccan spice blend and homemade tzatziki! 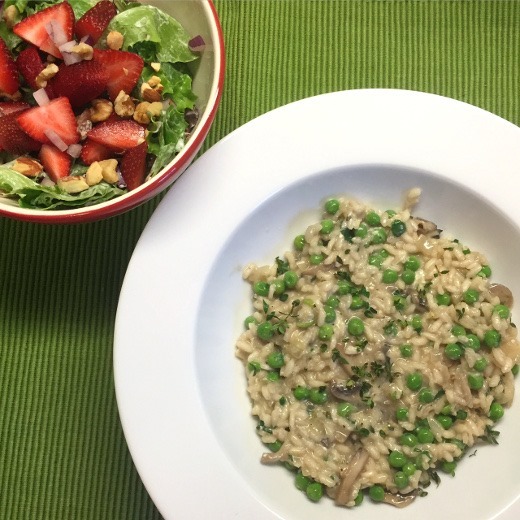 Plated is another service similar to Blue Apron and Hello Fresh that we’ve tried. 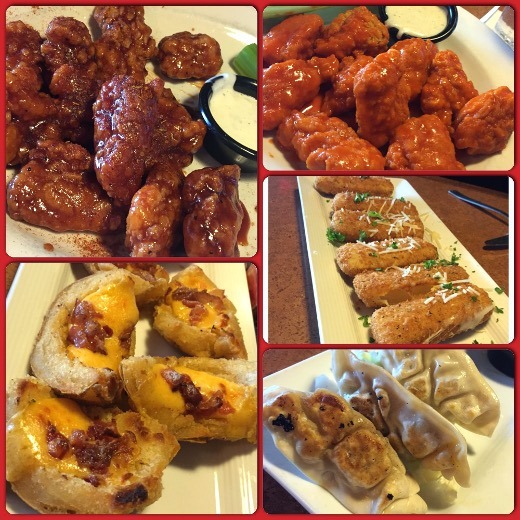 Each of the two dishes we tried were a hit. 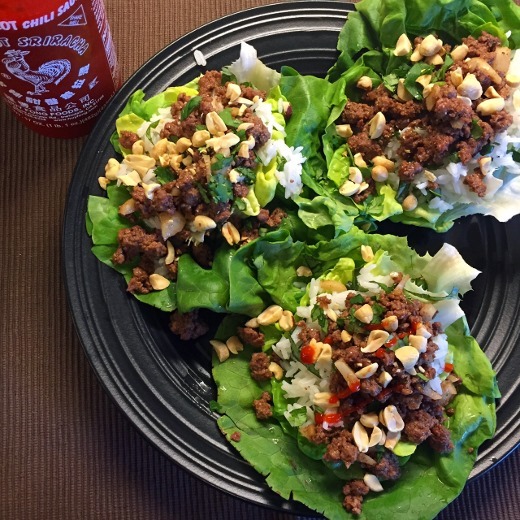 Beef Lettuce Wraps – Very delicious and flavorful and I’d love to make these again! They’re even better with a drizzle of Sriracha. 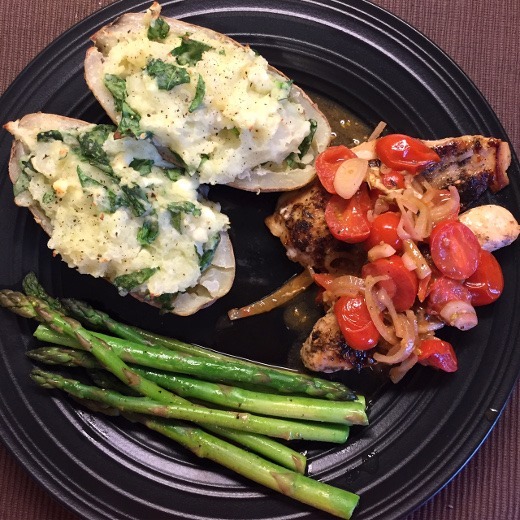 Za-atar Chicken with Twice-Baked Spinach Feta Potatoes – The chicken was fine, but the potatoes were especially tasty! I’ve never made twice-baked potatoes before and these were fun and easy to put together. The asparagus was my own addition. 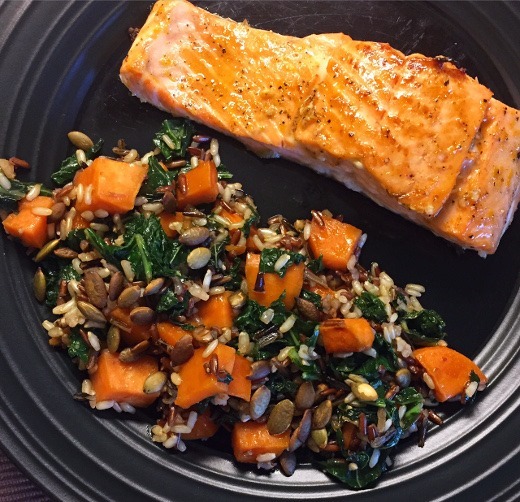 We try to eat wild-caught salmon about once weekly in our house to get a healthy dose of omega-3s and other pregnancy-supporting nutrients. (Though the first trimester I couldn’t really stomach salmon!) Here are a few variations on our weekly dose of salmon. Roasted Broccoli – Roasted broccoli is the bomb y’all – so much better than steaming it! Give it a try. 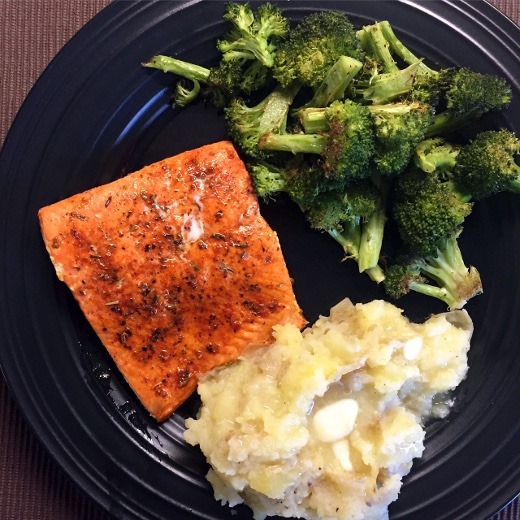 Inspired by my recent and first experience of roasting broccoli for a Hello Fresh meal, I again roasted up a few cups of broccoli florets (drizzled in EVOO, salt, and pepper, roast at 425 F for 15-20 minutes), mashed some Yukon Gold potatoes, and made our favorite salmon – blackened salmon. 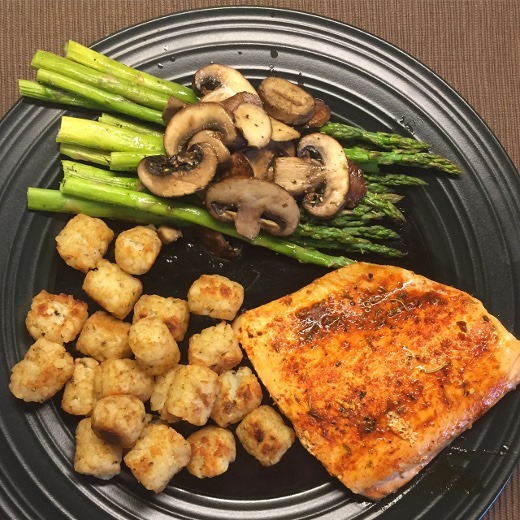 Blacked Salmon, Alexia Potato Puffs and another new-to-us veggie side: roasted asparagus and mushrooms. 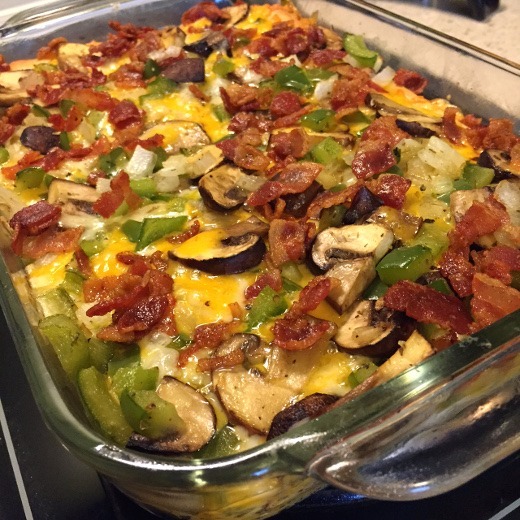 Another FAN-tastic side dish to add to our regular rotation! Of course this mama-to-be needs a few indulgences here and there! 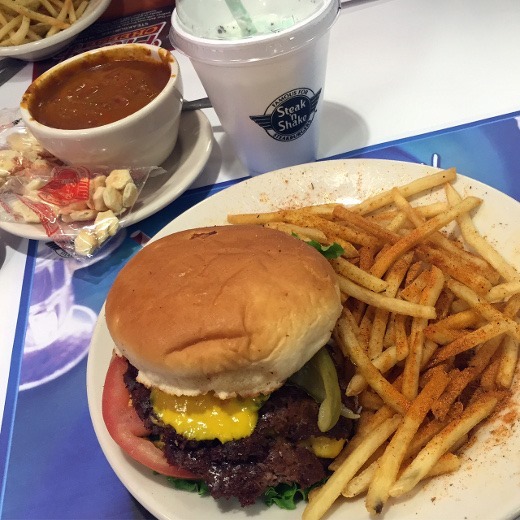 Steak ‘n’ Shake – go big or go home, baby. Double burger, Cajun fries, chili, and a mint shake! 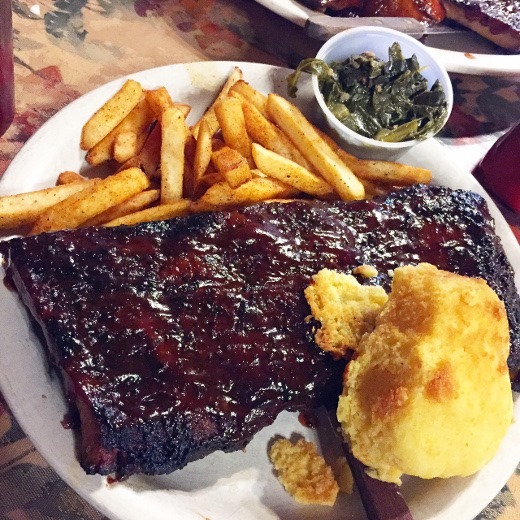 Bone Heads BBQ – Because BBQ. Their BBQ and sides are pretty solid. I’ve been really missing sushi but then it occurred to me that I can still eat veggie sushi! 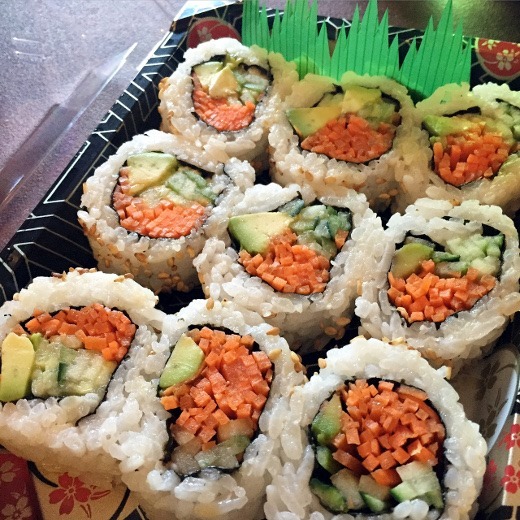 I tried out the veggie roll at Lucky’s Market and it was really good and very affordably priced. I’ll get it again in the future. Arirang – One day last week we visited Arirang for the first time in a quite a while. I think their prices went up! 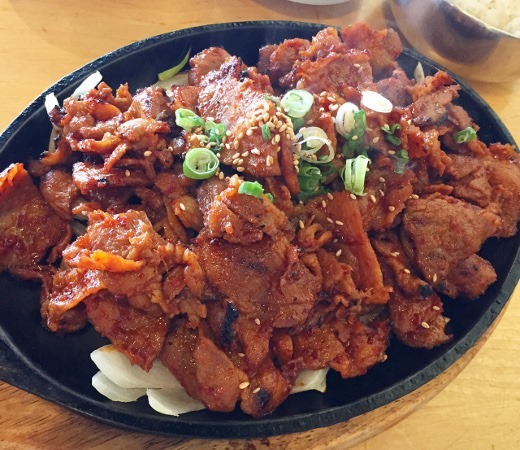 Their spicy BBQ pork (and their banchan) is wonderful but dang, it ain’t cheap. Might be a while ‘til we go back. Endless Apps – Okay, so this was kind of a YOLO thing for me personally. I needed to try the endless apps at TGIFriday’s because YOLO. I felt like an obese salt bomb afterwards, so there’s that. More MAIZ because they are the best! 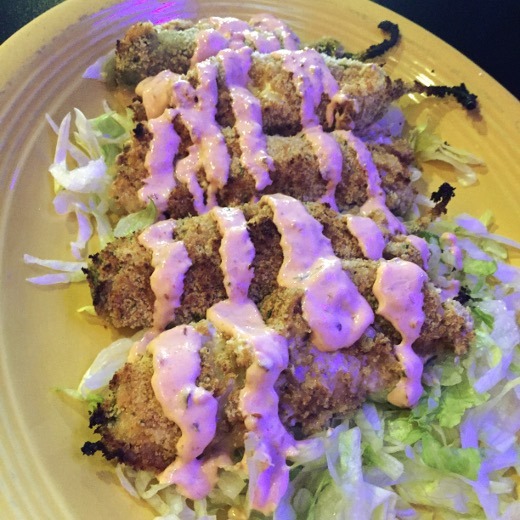 We ordered the same entrees as last time, but tried a new app – Roasted Jalapeños. Another winner! I love posts like these! I really do enjoy seeing what people have been eating, as strange as that may be. We also go out to eat twice a week. It is something that I really enjoy doing. I enjoy it too, and I’m glad to hear others find it interesting!